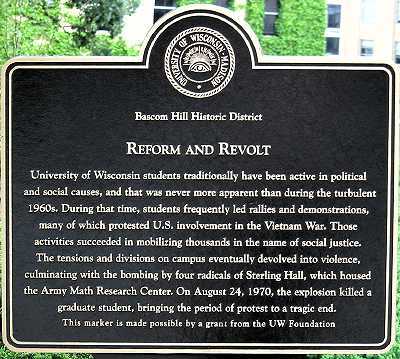 An older documentary from First Run Features, “The War at Home”, directed by Glenn Silber and Gary Alexander Brown, traces the anti-Vietnam-war movement at the University of Wisconsin in the 1960s, culminating in the explosion at Sterling Hall in August, 1970, as a protest against the Army Map Service. The film was originally released in 1980 by the Wisconsin Educational Television Network. But what’s interesting is how the sentiment built up that people who worked for companies or worked or military civilian agencies were personally responsible for the wrongs supposedly being committed in Vietnam. An earlier part of the film covers protests against Dow. The film does cover the draft, and mentions that students who got good grades remained deferred, while those who didn’t could become the fodder of war. Mandatory conscription was a major factor in the lives of young men of that day. It also says that President Nixon’s “Vietnamization” was clever because it would lower American casualties while still continuing the war for a while, with increased aerial bombardment. I remember my stop in Madison on Labor Day, 1997, as I drove out to Minneapolis in a corporate transfer. I attended the University of Kansas from 1966-1968, when I finished my MA in January before getting “drafted” myself. I had a professor, in Numerical Analysis, from Wisconsin, who was my thesis advisor. I remember that he thought that the atmosphere in Lawrence was quieter (and winter weather warmer) than in Madison. Some of the Sterling Hall incident remains unsolved today. The film could serve as a companion piece to Sony's "The Fog of War"
Wikipedia attribution link for Sterling marker.